Women's Human Rights: Seeking Gender Justice in a Globalising Age explores the emergence of transnational, UN-oriented, feminist advocacy for womens human rights, especially over the past three decades. It identifies the main feminist influences that have shaped the movement liberal, radical, third world and cosmopolitan and exposes how the Western, legalist, state-centric, and liberal biases of mainstream human rights discourse impede the realisation of human rights in womens lives everywhere. Ultimately, Women's Human Rights reaffirms a commitment to critically reinterpreted universal human rights principles and demonstrates the vital role that bottom-up, transnational movements play in making them a reality in women's lives. Niamh Reilly is Senior Lecturer at the National University of Ireland, Galway. "Essential reading on the ongoing development of a critical human rights practice." "Taking up the thorny issue of transnational feminist advocacy in the context of universal human rights protection, with all its visible failures, Niamh Reilly presents it as a case study in this well-grounded, thoroughly researched and timely book." "A book I wish I had written. 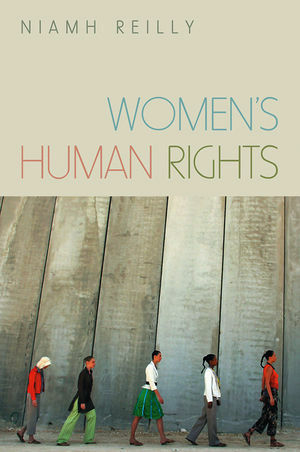 It is clear, authoritative, and covers off the main topics on women's international human rights in a way that would engage both an upper-year student new to the area and a seasoned academic wishing to deepen her own understanding." "A precious contribution to the scholarly literature. The major strength of the book is its particular focus on an optimistic and applicable implementation strategy for the development of a more effectiv and efficient global women's rights regime." "The way the author combines theory and practice is extraordinary ... This is only possible thanks to the experience and vision of the author." "Offers a compelling analysis of the historical shortcomings of human rights and their potential for women's human rights. Reilly's clear, succinct writing enhances the considerable merits of this landmark book that is essential for libraries and those committed to human rights and feminist projects." "A lucid, informative and persuasive book." "An important historical account of how feminist transnational advocacy has sought to challenge pervasive gender discriminatory practices on the international stage through the critical reorientation of conventional human rights thinking." "Niamh Reilly attempts and succeeds in tracing the evolution of the women's human rights movement while simultaneously accounting for how transnational female advocacy has influenced and transformed the body of international human rights.This book provides a thought-provoking and at times inspirational account of how transnational female advocacy movements have helped to shape the context in which many of us work on a daily basis. The most poignant argument of this book is that human rights are not a static set of legal norms, but rather a consensus that is continuously debated, developed and elaborated. In my previous career as a university lecturer, I would certainly have put this text on my undergraduate reading lists for International Relations courses." "Reilly has made a major substantive contribution to the fields of both gender and human rights with this book. Women's Human Rights records in rich detail and insightfully analyzes thr origins and progress of the global movement for the human rights of women over the past three decades. Notable for its breadth of scope, lucid writing style, and principled argument for continued advocacy to realise this unfinished agenda, this book is a must-read for all concerned with the future of women's rights in the 21st century." "Excellently researched, incisive and interesting. No contemporary account of the feminist movement and its project on women's human rights is complete without it." "Reilly has written an excellent and important book. Written in a clear and accessible way, the books deals with complex theoretical and political issues that need to be understood by anyone who attempts to understand contemporary issues of women and feminism in a variety of 'local' settings throughout the world today."